The Board of Supervisors is meeting on Wednesday, April 2, at 4pm to officially adopt its budget for next year. Public input will be no earlier than 6pm. Those wishing to speak can call (703) 777-0200 in advance or sign up in person at the meeting. On April 1, the School Board will be meeting to begin figuring out how to cut $38 million from their budget. According to one School Board member, Brenda Sheridan, the School Board has already received over 200 emails in less than 24 hours in support of keeping freshman sports. In the 24 hours following the straw vote where the Board of Supervisors decided not to fully fund the schools budget, the Board of Supervisors received around 50 emails against that decision. Will you send an email to the Board of Supervisors asking for more funding for every email you send to the School Board today and tomorrow? Will you commit to speaking at the Board of Supervisors meeting April 2 if you speak at the School Board meeting tonight? The Board of Supervisors have said that they think the amount they provided to LCPS is acceptable. Wouldn't it be a great show of force if the Board of Supervisors meeting room in Leesburg Wednesday night were full of people who support our schools as we expect the School Board meeting in Ashburn will be filled tonight? Could it even make one of the supervisors consider proposing an alternate motion to increase the funding for our schools? If enough people came, it might. In any case, though, the Board of Supervisors needs to hear from you every minute until the vote is taken. 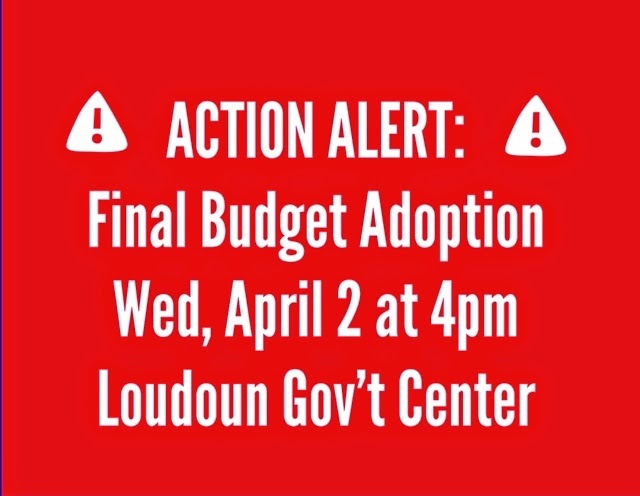 Email your supervisors at loudounbudget@loudoun.gov or call (703) 777-0204 and ask to speak to them. Tell them what the School Board is considering for cuts due to the underfunding of their proposed budget. There are real consequences to their vote to underfund our schools. Hold the Board of Supervisors accountable.